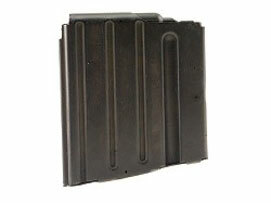 This 4-round steel magazine for the Panther LR-308 answers the demand for a durable and dependable magazine. Made of heat-treated 1050 steel with a manganese phosphate finish, this new steel magazine will withstand the rigors of the hunt. A steel floor plate, spring and plastic follower complete this tough and durable new magazine from DPMS. Additionally, this magazine will fit in the Knight's Armament Company SR-25.